A cookbook organized by ingredient with dishes suited to every skill level and created from her acclaimed restaurant Chef and the Farmer, Deep Run Roots features pure beauty in two hard covers. Each chapter starts with the story of how that ingredient relates to Howard's life and how she has come to love it in her cooking and it's attachment to Eastern North Carolina cuisine. This is simply one of those beautiful things that doesn't come around very often and when it does, it tends to not be appreciated. 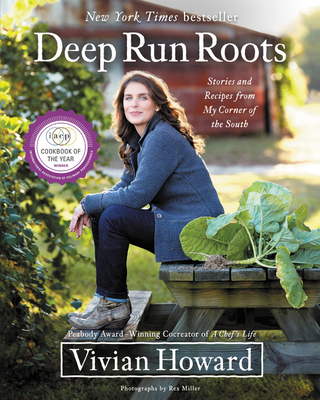 Please appreciate this storybook and cookbook as much as I do-- Deep Run Roots imparts the true tale of Southern food: rooted in family and tradition, yet calling out to the rest of the world. Vivian Howard is the chef and owner of the acclaimed Chef and the Farmer restaurant in Kinston, North Carolina, fifteen miles from her home of Deep Run. She trained under Wylie Dufresne and Sam Mason at WD-50 and was a member of the opening team at Jean-Georges Vongerichten's Spice Market in New York. The first woman since Julia Child to win a Peabody Award for a cooking program, she co-created and stars in the PBS series A Chef's Life.